Have you ever tried canning fresh fruits and vegetables at home? It can seem daunting at first, but once you make a couple of batches of home-bottled goodness you’ll find that it’s really quite a simple process. If you follow a tried-and-true recipe and stick to the directions, it’s a very safe way to preserve food while ensuring that you know exactly what’s going into it. If you’ve got fruit trees (or friends with fruit trees), you’ll love being able to eat all that wonderful, organic fruit all year long! And if you don’t, ordering a box of fresh peaches from a local farm or co-op is a great way to keep things local and fresh. I like to preserve peaches in organic, no-sugar-added fruit juice rather than in syrup…peaches picked right at the peak of ripeness are simply too delightful to smother in sugary syrup. Use the fruit juice in smoothies when the peaches are gone! Peaches are a high-acidity food, so they are easy to can in a water-bath canner. They do require one step that’s kind of a pain, and that’s removing the skins. To make this easier, dunk the peaches into boiling water for a minute or two. Then, pull them out and plunge them into ice water…this will loosen the skin so that you can peel it off in one or two big strips with your fingers. As you work, put the “bald” peaches into a bowl of water and lemon juice, to prevent them from browning. Cut them in half and pull out the pit. There are two ways to can fruit, hot pack (where the fruit is boiled before processing) or raw pack. I like to cook the fruit for the least amount of time possible, so I raw pack my bottles whenever I can. You can preserve peaches in plain water rather than in fruit juice, but you’ll have to use the hot pack method. If you need to avoid the extra natural sugar in fruit juice, you can find directions on how to hot pack peaches in water here. You’ll want to sterilize your canning jars before you use them, whether they are brand new or being used again. You can do this in boiling water, or if you’ve got a “sterilize” setting on your dishwasher you can use that. I find that if I start the dishwasher at the same time I start peeling the peaches, the jars will be ready to fill right about when I’m finished with the peaches. You’ll want to start the water in the canner boiling as you begin to cut the fruit and fill the jars with peaches, so it will be boiling away when you’ve got the jars full of fruit and ready to go. Pack the peach halves into the clean jars, using a canning funnel (like this). You’ll want to leave about an inch of head space in the jar. You can use any kind of fruit juice to preserve the peaches, but I like to use organic white grape juice. I find that it doesn’t detract from the flavor of the peaches, while apple juice can give the peaches a slight apple-y flavor. Boil the juice to sterilize it, and then fill the jars to within an inch of the top. You’ll want to slide something in the jar to “burp” the peaches…the space where the pit used to be can trap air, which will rise to the top as they process and may leave some peaches exposed. Even though the jars may look full at first, you’ll often have to add a bit more liquid to the peaches to keep them covered once you remove the air. The best tool for this is the little plastic blade or “bubble remover” that comes with the water bath canner, but you can also use a thin spatula or plastic knife (don’t use metal, as you may scratch the glass). 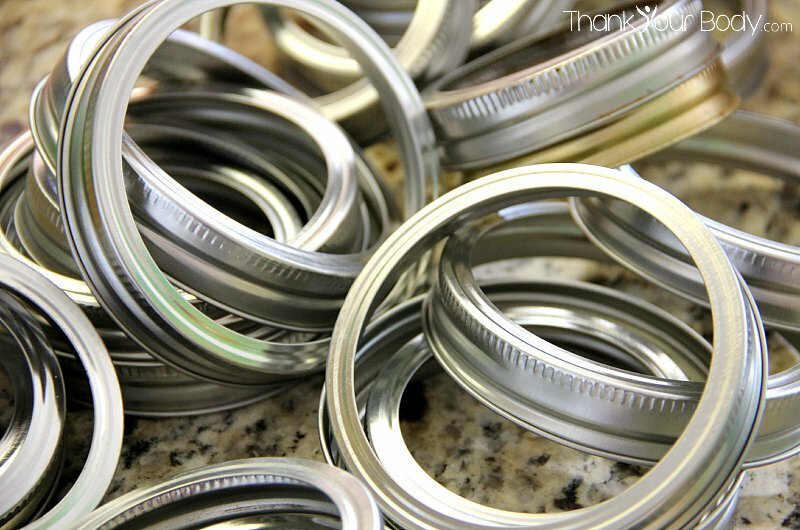 Once you’ve got the jars filled, wipe the rims clean with a towel and place a hot canning lid on top. Secure with a metal ring, and then place them in the canning rack. Carefully lower the rack into the water, and process according to the size of the jar and your elevation (see this chart to determine how long to process your peaches). When the time is up, carefully remove the jars of peaches and set them on a towel on your kitchen counter. Leave some space between the jars, to let the air circulate between them. Let them cool completely, the raised button on the lid should be sucked down firmly so that it doesn’t move when you press down on it. If the lids are firmly sealed, your peaches are safe for up to year! Nothing is prettier than rows of home-preserved food on your pantry shelves, and nothing is better in the middle of January than a bowl of peaches from Summer’s end…it’s like a little bowl of sun in the Winter! These peaches picked right at the peak of ripeness are simply too delightful to smother in sugary syrup. 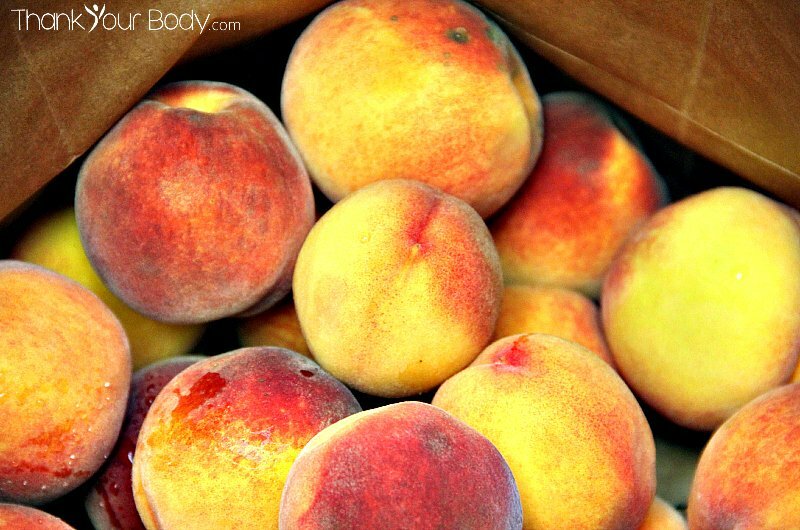 Learn how delicious peaches canned in fruit juice really is. Organic, no sugar added white grape juice (the amount you'll need varies, but for 7 quarts have about a gallon of juice available). Water bath canner with rack, jar grabbers, canning funnel, magnetic lid lifter, bubble remover or plastic knife, new jar lids, metal rings, 7 quart jars (wide mouth work best for peach halves). Bring a large pot of water to a boil. Begin sterilizing your jars, either in a separate pot of water or in your dishwasher on the "sterilize" setting. Drop peaches into the boiling water, making sure they are all submerged. Let the peaches blanch for a few minutes, then dunk them into a large bowl of ice water. To test if they are ready, pull one peach out and let it cool in the ice water, then try the skin to see if it will slip off. If not, return it to the boiling water and try again in another minute. Slip the skins off the peaches and transfer the "bald" peaches to a bowl of water with a little lemon juice. Continue this process until all the peaches are skinned. Note: apparently you can make jelly out of peach skins! I've never tried it, anyone have experience with this? Pour the juice into a large stock pot and bring it to a boil. In a smaller pan of water, heat the metal canning lids (but do not boil). Fill your water bath canner about ½ full, and start the heat under it. As the juice warms, cut the peaches in half with a paring knife, and remove the pits. Using a canning funnel, carefully pack the peach halves into the sterilized jars, leaving about an inch head space at the top. Ladle the hot juice into the jars, leaving an inch to ½ inch head space. "Burp" the peaches by slipping the bubble remover or a plastic knife between the packed peaches and the sides of the jar, to remove air. Add more juice if the liquid level falls after bubbles have been removed. Wipe the rim of each jar carefully with a clean towel, to ensure a good seal. Using a magnetic lid lifter, remove the hot lids from the water and set them on the jars, securing them with a metal ring (you'll want these finger-tight, no need to really cinch them down). By now, the water in your canner is probably boiling. Set the finished jars in a metal canning rack, and carefully place them into the canner. Process quarts for 30 minutes, adjusting for altitude as per this chart...if you live at a higher altitude, it could add as much as 20 minutes to your processing time. Remove the finished jars from the canner. Set them on a towel on your counter, where they won't be in a draft. Allow space between the jars for air to circulate. Let them cool completely, and check that the lids are sucked down so that the don't give when you press on them. Reprocess any jars that are not properly sealed, or put them in the fridge and eat them within a few days. Store finished jars for up to 1 year. Once jars are opened, store any remaining peaches in the fridge. Have you tried canning fruit at home?